No. 38 Stanford men’s tennis (12-4, 4-0 Pac-12) finished a perfect weekend with back-to-back wins on the road that extended their winning streak to six games. 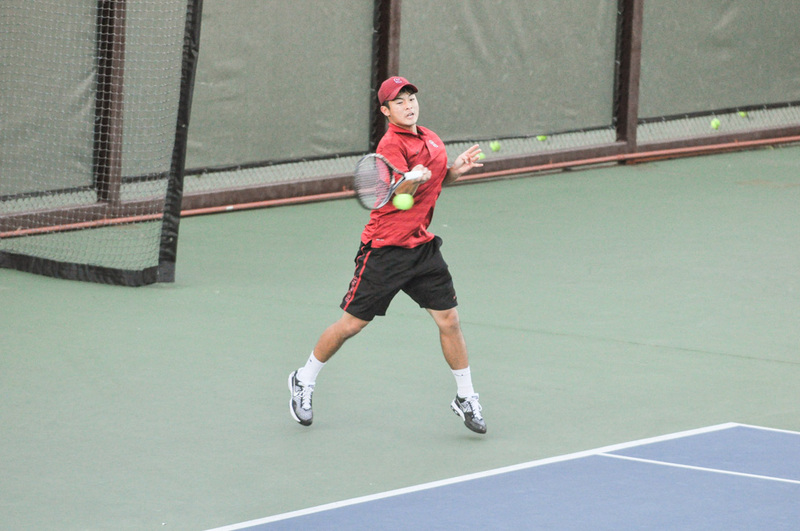 Stanford’s first victory came in a close 4-3 matchup against No. 51 Oregon (11-8, 0-4 Pac-12). The top two doubles courts quickly won out for Stanford, allowing them to clinch a crucial doubles point. Seniors John Morrissey and Robert Stineman won 6-2 while freshman Tom Fawcett and junior Maciek Romanowicz came out on top in a 6-4 match. Stineman then won in singles 6-3, 6-3 to add to Stanford’s tally. Oregon managed to pull one back with Jayson Amos defeating junior Nolan Paige 7-6 (3), 6-1 before No. 95 Morrissey beat Daniel Sardu 6-4, 6-4. Oregon stole the next two matches to even up the score at 3-3. Two of Stanford’s freshmen, Tom Fawcett playing on the first court and David Wilczynski on the third, lost in three sets. Fawcett lost 6-1, 4-6, 6-3 while Wilczynski fell 3-6, 6-3, 6-2. However, it came down to the match on court six where another freshman, David Hsu, pulled out a massive 7-6 (1), 2-6, 6-4 victory to give the win to Stanford. Hsu’s match was critical in solidifying Stanford’s place in the top half of the Pac-12. There is a distinct divide in the Pac-12 when it comes to conference play. The top four teams all have 4-0 records and the bottom four all have 0-4 records. Stanford went on to extend their unbeaten streak in conference play on Sunday against No. 59 Washington (10-9, 0-4 Pac-12) with a more comfortable 5-2 victory. The Cardinal were able to grab the point in doubles play with quick victories on the first and third courts. The nation’s No. 40 doubles team Morrissey and Stineman breezed through 6-2 followed by another quick 6-2 victory for Paige and Wilczynski. Stanford won convincingly in singles play with the game being won before Washington could clinch their second point. Wilczynski finished his match first with a 6-2, 6-2 triumph on the third court. Junior Anthony Tsodikov fell for Stanford in his 6-4, 6-1 defeat allowing Washington to get onto the board. The Cardinal then went on a streak of three straight wins to solidify the overall victory. First came No. 43 Tom Fawcett who issued a surprising 6-4, 6-1 thrashing of No. 89 Mitch Stewart. Next, Robert Stineman finished his match 7-5, 6-4 to get the all-important fourth point. Maciek Romanowicz earned an additional point by winning 7-5, 6-1, 1-0 (8) against Washington’s Viktor Farkas before No. 95 John Morrissey fell to Jake Douglas in three sets. Following the two victories, the Card will look to build on their impressive season as they face off against Fresno State in non-conference play and then attempt to upset No.15 UCLA in an important Pac-12 battle.